The recent phono stage shootout got me thinking about them again and I've been looking at various circuits. This one caught my eye as seeming to be remarkably simple and elegant, it's one that Broskie posted on TubeCAD in 2015 and it looks like it's flown under the radar a bit - not sure if anyone has actually built it. 1) The Source and Drain connections are not marked on the schematic - what would connect to the 6SN7's cathodes, the source or the drain? 2) The value of the resistors between the FETs and 0V is not specified. Would this value need to be arrived at based on the 6SN7 operating point - i.e. treat it as the 6SN7's cathode resistor and select accordingly? 3) If I understand cascoding correctly, the grids of the first 6SN7 stage are held at +15V (requiring a separate bias supply) - have I got that right? If I remember correctly, the gain of the first stage will be the transconductance of the jFet multiplied by the anode resistor on the 6SN7 above - think of the jFet and triode section forming a pentode. I think you'll only get MM gain on this overall looking at the values. The +15V could be supplied by a voltage divider ( with cap to ground ) from the B+ , if that is reasonably stable - which it ought to be, the thing being differential. Use the 2sk389 model as thats two 2ak170's in one device. I don't want to be a party pooper but I see a lot of issues to be gotten over. 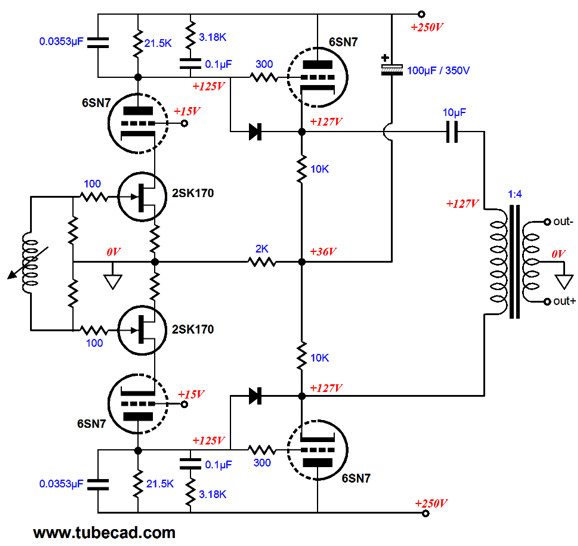 I like the tranconductance amp idea (wish mine would work) but to have the RIAA in both halves (try getting that to match up with two cascodes in push pull will be heroic IMO (mucho FET selection) and then that DC coupled to the follower bit. I can't see the advantage of it being differential/PP or whatever esp with a parafeed output transformer which is also problematic to some extent in a phono with all that bass boost and then a parafeed lump added in as well. I'mm a PP/differential fan but IMO, this might be a step too far. Now half of it could be OK.
Edit: And I just realised, this a post in beginners. I would say as a PP phnoo design, not a beginners project. SE could be the go though but still you'd be on your own in a way, if no one has built it before. Last edited by izzy wizzy on Tue May 29, 2018 6:54 pm, edited 1 time in total. Good points, you could get a close-ish match using a LSK389, and I would think it would be possible to do the RIAA as between RC's the two halfs instead of two isolated blocks. Simulation would make this a lot simpler to work out. 3. Yes. As Mark said, or with a zener or tl431 or whatever you prefer. For that kind of circuit, I suppose just look at Allen Wright's RTP3C or D ? Indeed which is as Mark suggested Allen's RTP series could work but again, a beginners project? Just saying as phonos like this are no picnic and Allen's designs have a unique flavour from what I've heard. I wouldn't want to see it being too hard for early success. The RTP3C/D phono is VERY good, I heard it at ETF2005 phono shoot-out. It was the closest to the LCR ones, all of which were a touch better on tone in the lower mids as expected - but it's a very transparent and natural-sounding phono. His Ecc88>300B PP amp is a different kettle of fish though. Good if you like 3rd & 5th harmonic a lot and your teeth need de-scaling. Thanks everyone - esp. Nick for giving me some figures to start off with. Appreciate the input. I posted in Beginners because I realised I knew very little about FETs - valves I have a far better handle on. I know I'm being a smidge ambitious - phono preamps are awkward buggers to get right at the best of times, hence my current use of the Whest, and DIY-ing everything after that point. The Whest does set the bar quite high so it needs to be a good one to make it worth my while. I still have to complete the power amps before I start anything else really. I guess it was hearing the difference that stages like Nick's can make at the weekend that has got me thinking - sadly I don't have the budget for the Reference! I've come across the Wright RTP3* designs before, and they are quite similar in principle to that Broskie circuit. There's a long thread on diyaudio with early contributions from Allen before he passed. I'll carry on poking about in Spice and see what comes out. Also found, on this very site, a similar thread from Paul Barker a couple of years ago exploring balanced phono stages - as well as the Wright, it seems that the latest Morgan Jones (which I have on Kindle) has a balanced hybrid RIAA circuit too which looks quite similar. The advantage of the latter of course is that it is VERY comprehensively documented. Ugh - why did I buy the Kindle version of the latest Morgan Jones? WHY? Figure 7.49 which shows the circuit diagram with component values - kinda critical if you want to try building it - is too low-resolution for the component values to be legible. Thank you Amazon (or whoever was responsible for the e-book). I've already paid for this book once, looks like I'm going to have to pay for it all over again in a different format if I want to be able to see the bloody diagrams properly. Is it the same one as in the third edition of Morgans valve amplifiers book? One with the ecc8010 on the front end of it? Thanks for giving me a birthday present idea - I really should have a copy of Morgan's latest book - which seems to be the fourth edition. My fourth edition is Chinese (a gift from Morgan himself), but diagram 7.49 and the component values are readable. 7.49 is not in the third edition.